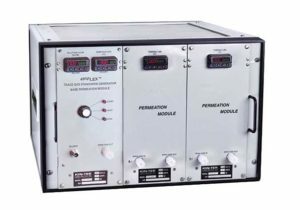 491Flex™ Gas Standards Generator | KIN-TEK Analytical, Inc. The 491Flex™ is ideally suited for creating trace concentration – ppm, ppb, and pptr – mixtures. The 491Flex™ uses KIN-TEK Trace Source™ disposable, refillable and diffusion permeation tubes for over 500 Supported Chemicals. The example 491Flex™ System above contains a 491Flex™ Base Module, 491Flex™ PM and 491Flex™ IM. Please click the “Specifications” tab above to see more features and specifications of the 491Flex™.